Manipur GK Quiz Questions and Answers: Meghalaya a state known for its natural beauty, amazing monuments and exited tourist attractions. Wants to know more about Manipur??? Follow our Manipur GK Quiz which gives you complete information about Meghalaya. In this competitive world, every individual should have the General Knowledge to crack many of the Competetive Exams. Manipur GK Quiz questions are profitable in different competitive exams like Civil Service, SSC, UPSC, Groups and many others. Manipur GK Quiz Questions and Answers are enclosed to you in pdf format. So, you can download it directly and use it for knowledge. Manipur Quiz Questions help you, people, to analyze yourself for the sake of actual competitive exam. Manipur Quiz makes you feel just like a competitive exam. So, move on to further details of Manipur GK quiz. Here we are enclosing the details of Manipur GK Quiz. This Quiz has 25 questions with four choices each. The time given to complete the quiz is 30 minutes. So, utilize the time given to you properly to have a good score in competitive exams. Tabular information is given below look at the details of the quiz. So, hurry up take this quiz given below. 1. What is the area of Manipur? 2. Which state is to the north of Manipur? 3. Total Number of National Parks in manipur? 4. Who is the Governor of Manipur? 5. Who is the First (1st) CM (Chief Minister) of Manipur? 6. What does Manipur mean? 7. When was Manipuri added to the eighth schedule of the constitution? 13. How many Districts in Manipur? 14. literacy rate of Manipur according to the year of 2011? 15. Which is the official language of Maharashtra? 16. Which sea is to the west of Maharashtra? 20. Which is the largest lake in the Manipur state? 21. Who was Manipur’s chief minister in 1995? 23. How many towns are there in the state? Manipur is in the northeast part of India. The capital city of Manipur is Imphal. Manipur is the paradise of India. It is Jeweled land with splendid natural beauty and rare species of animals. Many of the famous personalities prided Manipur due to its warmth weather.St. Clair Grimwood felt Manpur as ” A pretty good place and is more beautiful than many of the places in the world.” First prime minister of India Pandit Jawaharlal Nehru described it as “Jewel of India.” Manipur is such a pleasant place. 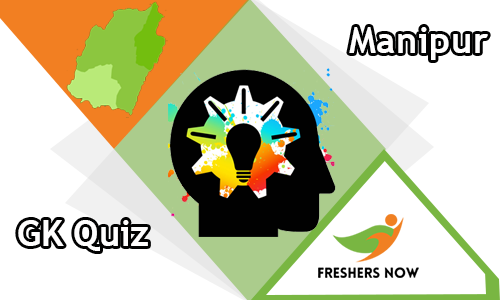 You can build confidence in yourself to face the competitive world by attempting this Manipur GK quiz. You can get more information about Manipur like its tourist places, famous personalities its culture and customs. Helps to score good marks by practicing the questions you faced in the quiz. You can attain time management by having this Manipur GK quiz. The results of Manipur GK quiz appears in grades, points, and marks. By the results of the quiz, you can know your mistakes and time sense to spend on each question. Proper submission of the quiz is essential. Results are given after the appropriate submission of examination or after the time expired to the quiz. Moreover, analysis of the questions with answers is given to you guys. For furthermore details and to know about various quizzes we are providing, keep visiting our site Freshersnow.com.